The Virginia Statute for Religious Freedom was written by Thomas Jefferson in 1777, introduced in the Virginia General Assembly in 1779, and on January 16, 1786 enacted into state law through the assistance of James Madison. 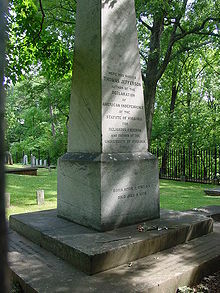 The legislation is one of only three accomplishments Jefferson instructed be included in his epitaph. Jefferson, who authored the phrase, "wall of separation", and Madison, who penned the 1st amendment, thus have both their views represented in this legislation so crucial to today's debate over Separation of church and state. “ An Act for establishing religious Freedom. Therefore, it appears that this was actually a more liberal statement by not using the name "Jesus Christ" at the time, much moreso than the clearly Christian origins of William Penn a century earlier. The Virginia legislature wanted to ensure all religions were "within the mantle of it's protection". Nevertheless, while it may have protected the beliefs of atheists or "infidel[s]" as Jefferson stated, the references to a Creator show such a belief was requisite for stating inalienable rights accorded by law. ↑ Virginia Historical Society. "16 January 1786: Statute for Religious Freedom." On This Day: Legislative Moments in Virginia History. ↑ Mount, Steve. "Jefferson's Wall of Separation Letter." USConstitution.net. ↑ Jefferson, Thomas (1802, January 1). "Jefferson's Letter to the Danbury Baptists." Library of Congress. ↑ "Act for Establishing Religious Freedom, January 16, 1786." Shaping the Constitution. Virginia Memory: Library of Virginia. ↑ "Transcription: Act for Establishing Religious Freedom, January 16, 1786." Virginia Memory: Library of Virginia. ↑ Jefferson, Thomas (1821, January 6). "Autobiography." ↑ Gilbert, Kathleen (2012, February 20). "2,500 Religious Leaders, Every U.S. Bishop Oppose Obama Mandate." LifeSiteNews. This page was last modified on 12 June 2012, at 07:44.